It’s well-known, at least by me, that among franchised lengthy sandwiches (known by different names in different parts of the country) the Blimpie sandwich is vastly superior to the Subway sandwich experience. The reason for this is simple. Blimpie uses much softer bread that soaks up all the oil and vinegar that I have applied. Subway bread has no such soaking capacity whatsoever. In addition, you have your choice at Blimpie whether you want red onion or white, and I always choose the latter. Only red onion is available at Subway. Your choice of meat is much more generous at Blimpie and your sandwich is always thicker. Last but not least, baking is done on premises at Subway. You might think that would produce an inviting bakery smell. Quite the opposite. Subway stores feature a unique, unmistakable stench made by whatever noxious chemicals and solutions are used to make the bread. Now, in 2014, the market has spoken, at least in NYC, and Subway has a vastly bigger ad budget and much better coverage. It’s possible to walk 4 blocks and encounter two Subway stores. Alas, in NYC the number of Blimpie stores has dwindled to twelve, with 3 in Brooklyn, 4 in Manhattan, 5 in the Bronx and none whatsoever in Queens or Staten Island. 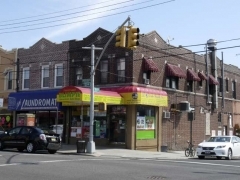 In fact many Blimpie franchisees can’t afford their own space and lease space from delis or bodegas. 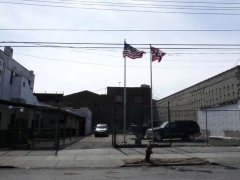 The other day I thought I had stumbled on one of these on Northern Boulevard not far from my home. It was a false alarm. There was a sandwich shop inside, but they had not gotten round to taking down the Blimpie sign. This is not the first time an inferior product has been inexplicably chosen by the public. The process continually plays out on the pop charts, in Hollywood, in general elections and in company hiring practices. Recently while free-lancing at Tiffany & Co. (I am likely the only worker at Tiffany & Co. who lunches at Blimpie and Papaya Dog) I was angered to find that the reliable Blimpie branch I had frequented for years, at 4th Avenue and East 13th, had vacated the space. Can you imagine the horror? I was forced into Subway again. I was getting desperate. I remembered that on one trip I made to Dyker Heights in 2013, I rode the bus on 13th Avenue past a Subway sign. The craving was palpable, so I made my way to Dyker Heights. 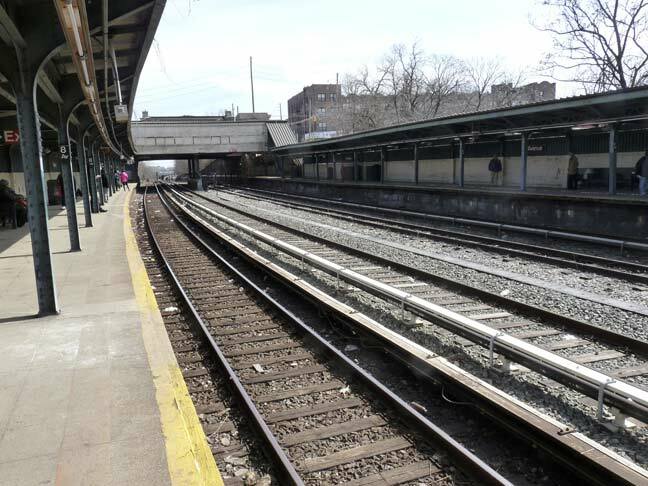 Now, it’s not easy to attain Dyker Heights on a subway. 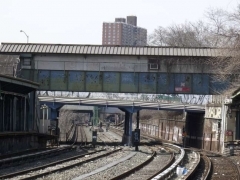 You can take the R train along 4th Avenue to 77th or 86th Streets, and walk quite a way. Or, you can take the D train along New Utrecht Avenue and walk quite a way. Or connect to a bus. 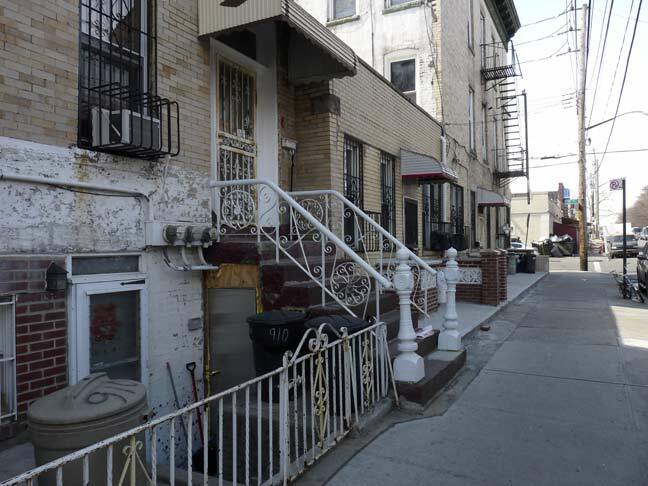 Before 1997, the poor devils in Dyker Heights were in a two-fare zone. I hope they were paid more at their jobs because of that. 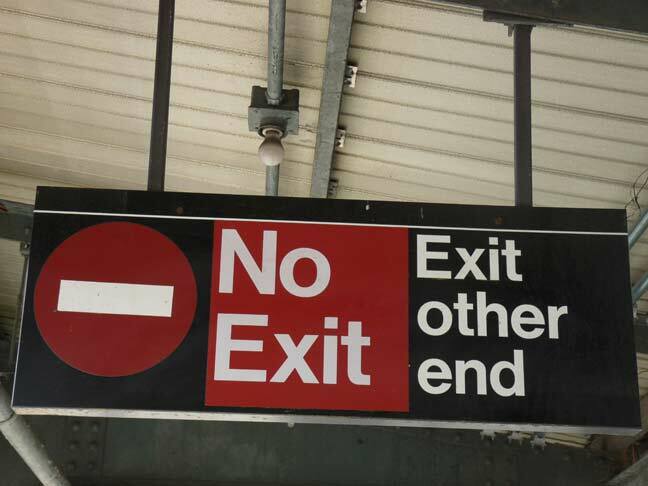 I emerged from the R train at 77th Street and set out east. 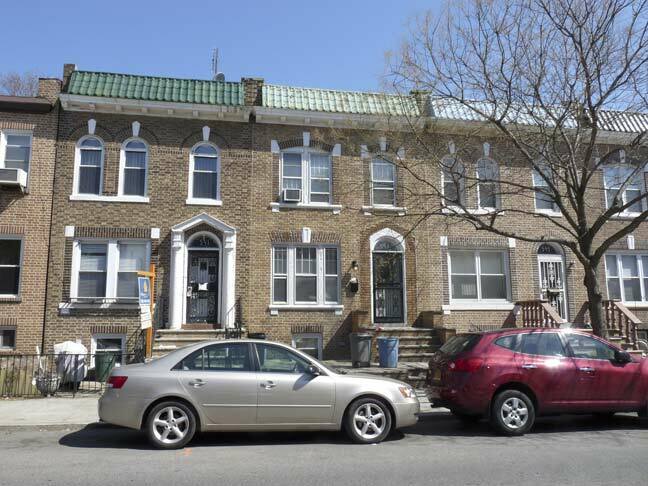 Bay Ridge is not considered in the same breath in the NYC guides as the Park Slopes and Bedford-Stuyvesants, but its side streets are lined with handsome attached brick buildings. Many of them feature bays, or structures that jut out from the front and afford three separate views to those sitting in them. Some bays are flat, but the ones here on 77th are semicircles. Though I’m satisfied with current lodgings in Little Neck, It’s always been an ambition of mine to occupy one of these bay-fronted buildings. 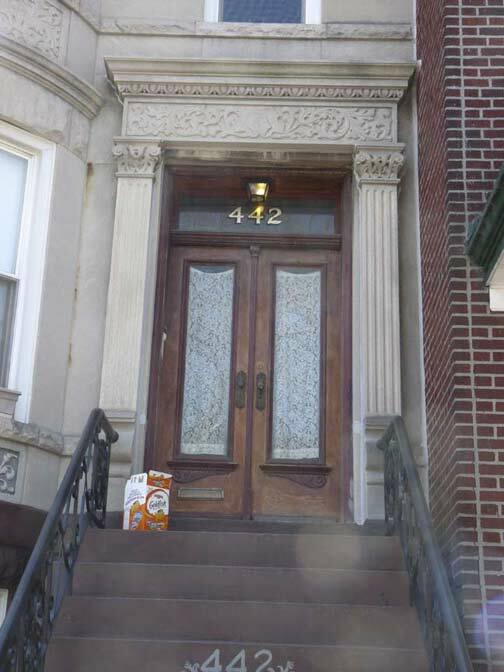 Many of them still have their wood doors, complete with curtains, and even the stenciled address on the transom has been in place for decades. Handsome pilasters frame the entrance. 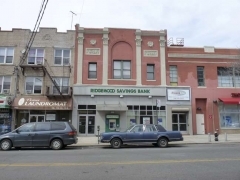 These buildings appear to have been built between 1890 and 1910. Elsewhere on the block. 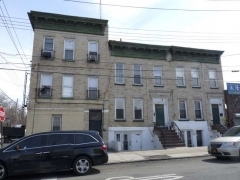 Construction like the bay-front buildings is no longer possible in the present day and age, where detail is considered an expensive sidelight. 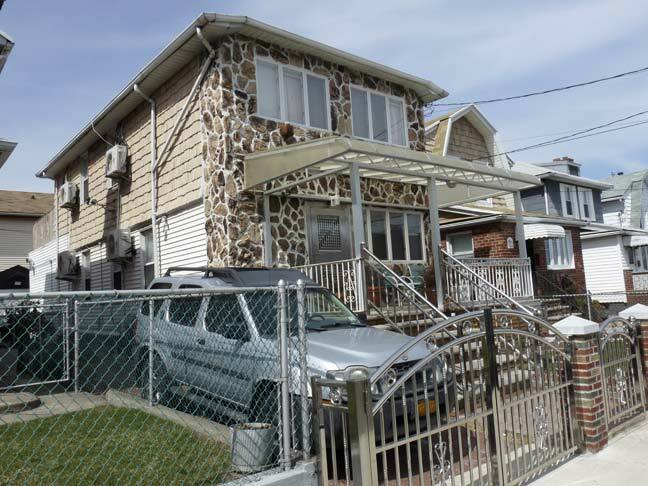 The quick and dirty is favored these days, along with sunken garages to evade those nasty on-street parking regulations. I like the quoins on the side, though. 5th Avenue and 77th Street. Brick buildings with apartments on the top two floors and storefronts on the bottom has been a staple of NYC’s “provincial” neighborhoods for decades. This batch was likely constructed in the early 1920s when Bay Ridge was booming as the old shorefront mansions gradually disappeared and the BMT arrived in 1915. Look closely for a painted sign advertising “Three M” Realty, which vanished years ago. A smaller painted sign above that is unintelligible. 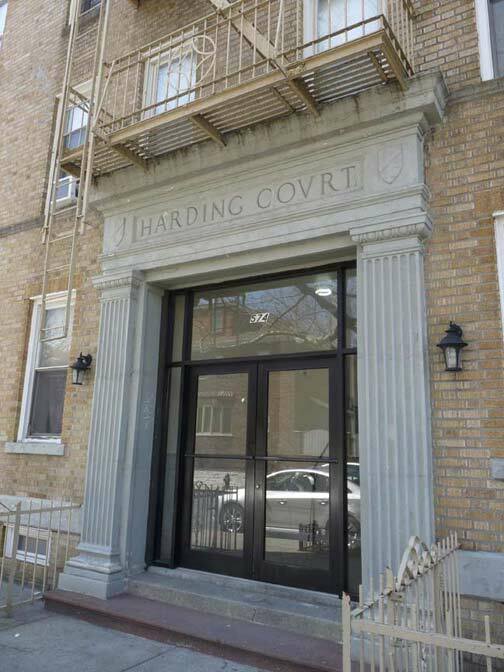 There are a number of buildings in NYC called “Harding Court.” They can likely be dated to the years 1921-1923, when Warren G. Harding was president. 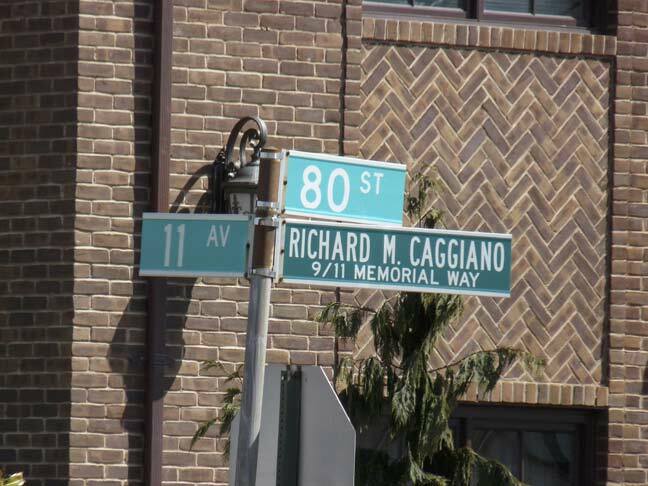 Harding’s administration was compromised by financial scandals and he died from a heart attack in office, but from 1921-1923 it was just plain patriotic to apply the name of whoever was president to your building, or, in the case of a new street being built, Harding Avenue in Throgs Neck or Coolidge and Hoover Avenues in Briarwood, Queens, which likely had a Republican developer. Man has attempted to force Nature to adhere to its dictates for millennia, and the attempts have usually led to trouble. 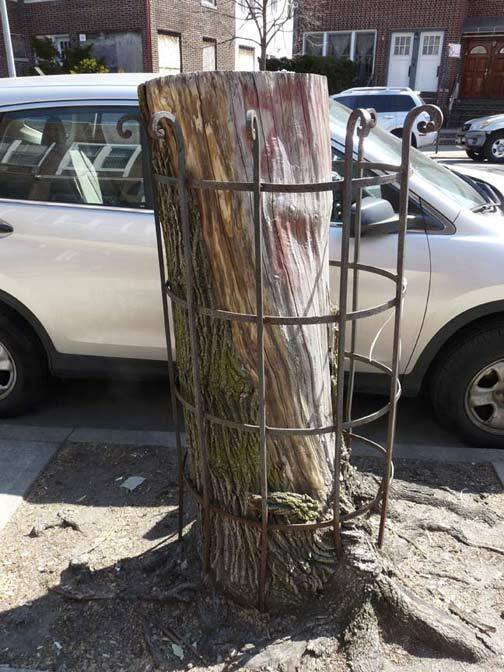 A caged tree will try to break free and run wild, until Man’s only solution is to chop it down. 6th Avenue and 78th Street. 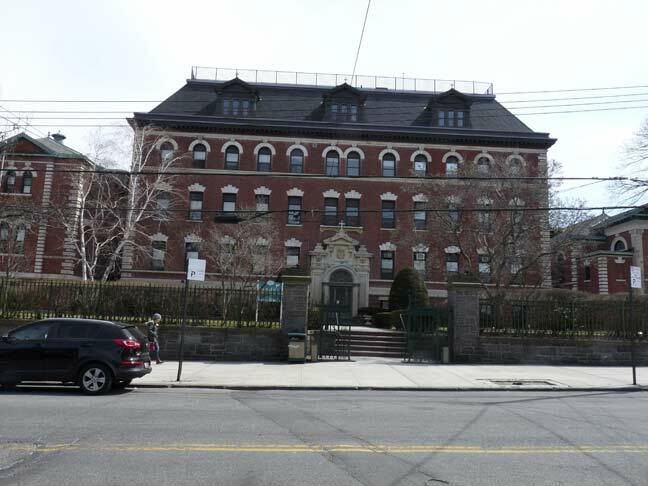 The imposing PS 127, or the McKinley Park School, toiled here at 7th Avenue between 78th and 79th Street tucked away in semi-anonymity until the late 1950s, when construction of the Verrazano-Narrows Bridge and its approach roads left it out in the open for all to see. 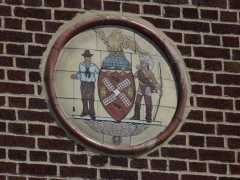 Presently, the school serves grades K through 5. 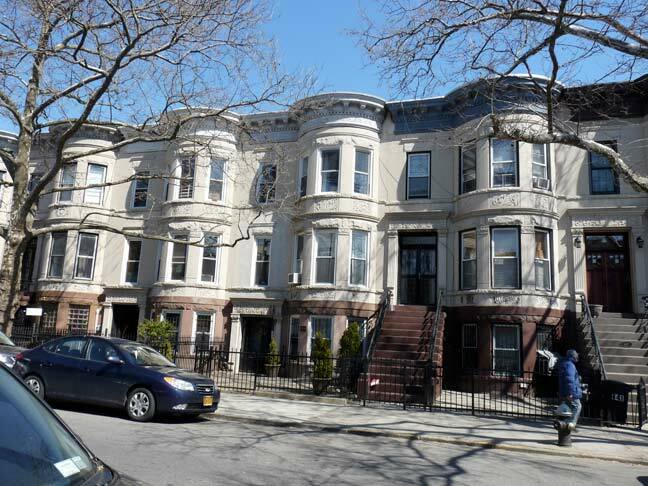 The rococo Parkway Towers, at #901 80th Street, just east of 7th Avenue. 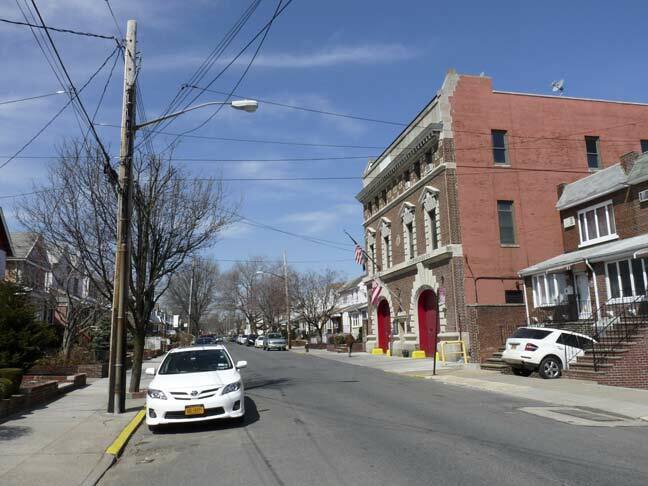 It’s a long story why there would be a #901 just east of 7th Avenue, but a complicated street grid in Bay Ridge and Dyker Heights devised in the late 1800s left no intermediate avenues between 7th and 10th Avenues south of 73rd Street. 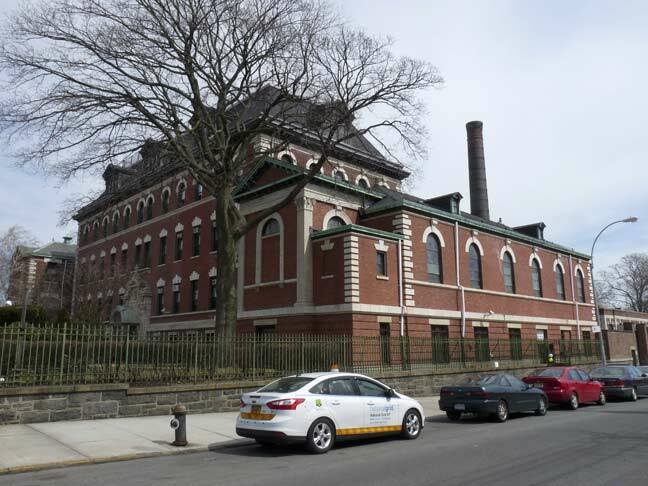 Fort Hamilton Parkway, one of the first roads built in the neighborhood, connects Fort Hamilton and Prospect Park and scythes through the grid, a busy truck route. Parkway Towers is another imposing building that was left out in the open when the expressway cut was made. Residents on the top floors received pleasant views they hadn’t had before. 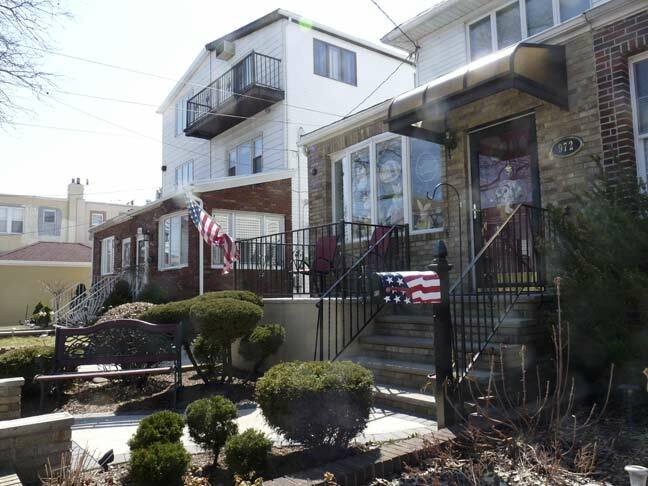 Southwest Brooklyn, including Bay Ridge, Dyker Heights and Bensonhurst, is more politically conservative than other NYC neighborhoods and residents fly the red, white and blue year-round, often for no particular reason. One homeowner on 80th Street between 7th and 10th Avenue has painted their mailbox with a flag motif. 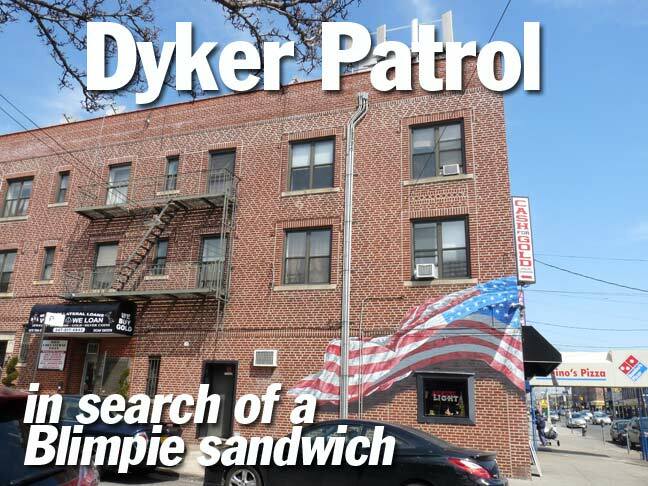 The name “Dyker” presents a bit of a puzzler for Brooklyn lexicologists. 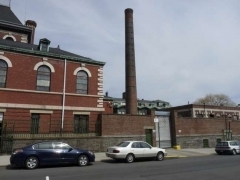 In Brooklyn By Name, Leonard Benardo and Jennifer Weiss assert that Dutch farmers who built dikes to drain the area’s wetlands in the colonial era gave it its name. 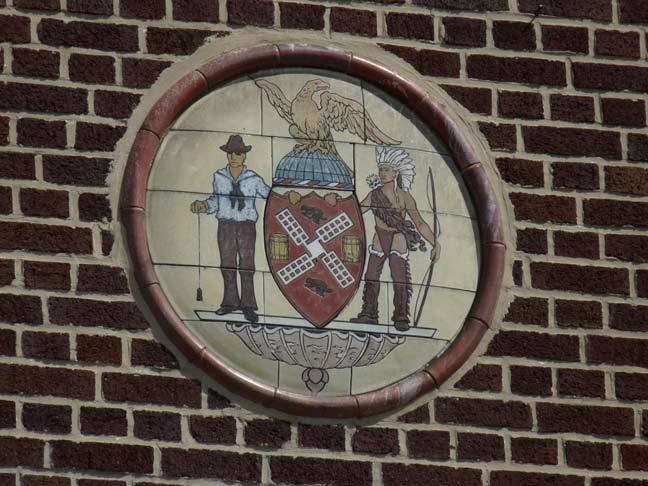 However Van Dyke is a common Dutch name and a family of that name did have a hand in its development in the mid-1700s. 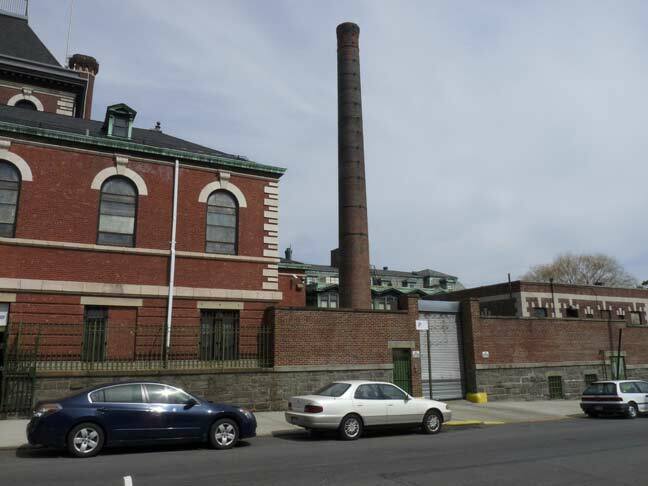 Dyker Heights was more strictly defined when the Gowanus Expressway was completed in 1964, as the neighborhood’s boundaries can be set at 86th Street (and the Dyker Park Golf Course, where Tiger Woods’ father Earl played) the expressway, 65th Street, and 14th Avenue. 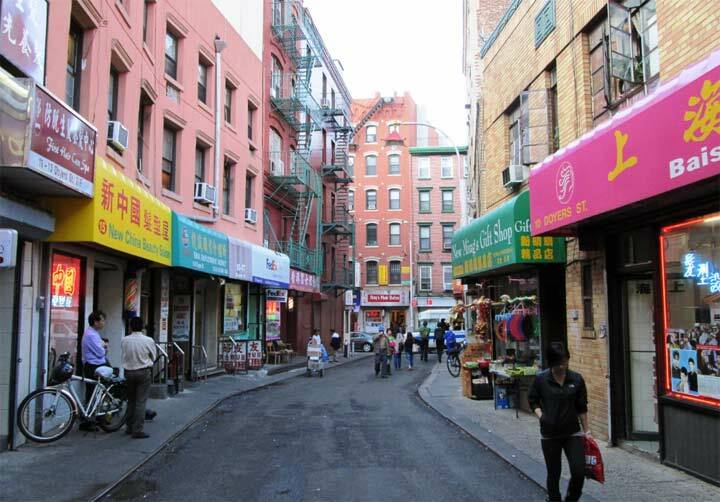 It’s overwhelmingly residential and the only business streets are Fort Hamilton Parkway, 13th Avenue, and parts of 11th. The neighborhood is best-known and most heavily chronicled during the Christmas season, when many locals construct extravagant Christmas displays, especially along 84th Street between 11th and 12th Avenue. St. Philip’s Episcopal Church occupies the entire frontage on 11th Avenue from 80th-81st Streets. According to the church’s website, St. Philip’s was completed in 1900, with the steeple added in 1907. It has been called “The Little Country Church on the Hill” and must have originally served farms and isolated homesteads in the region. According to the church, the two windows on the south side of the sanctuary (shown here) are Tiffanys. • Before the miraculous feeding of the multitude, Christ turns towards Philip with the question: “Whence shall we buy bread, that these may eat?” to which the Apostle answers: “Two hundred penny-worth of bread is not sufficient for them, that every one may take a little” (John vi, 5-7). • When some heathens in Jerusalem came to Philip and expressed their desire to see Jesus, Philip reported the fact to Andrew and then both brought the news to the Saviour (xii, 21-23). He was a friend of Bartholomew (a.k.a Nathaniel) and is often mentioned with him. 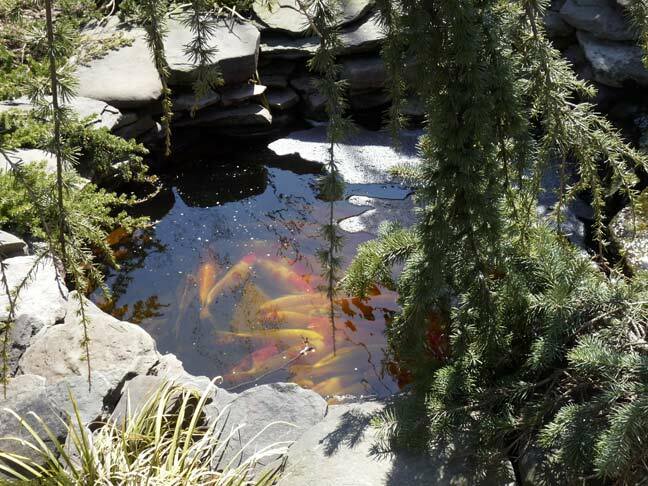 The house at the corner of 11th Avenue and 80th Street featured a pool full of koi, which are related to goldfish as both are species of carp. It was a cold day and these fish were clustered at the bottom of the pool without moving. I hope the cold weather had made them sluggish. 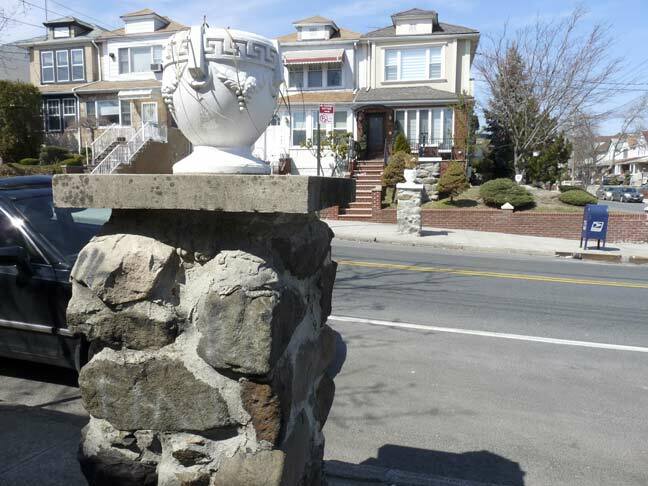 Some parts of Dyker Heights were developed as self-contained communities, as this pair of gateposts at and planters at 11th Avenue and 79th Street indicates. 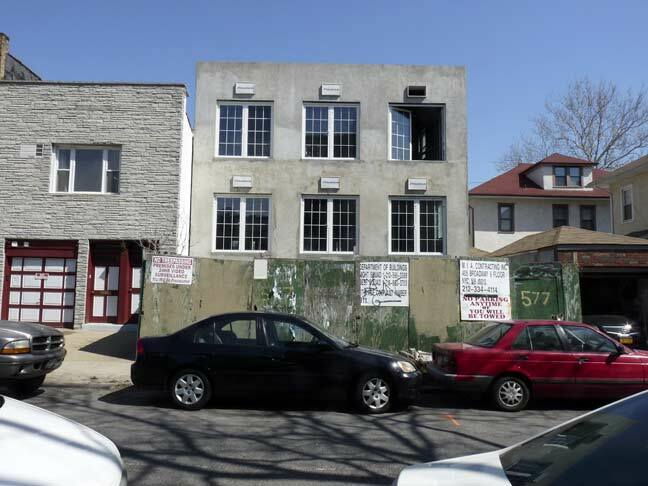 In the 1960s I was a frequent visitor to #1135 79th street, as it was home to some cousins in the Wall family and my parents would bring me over now and then. 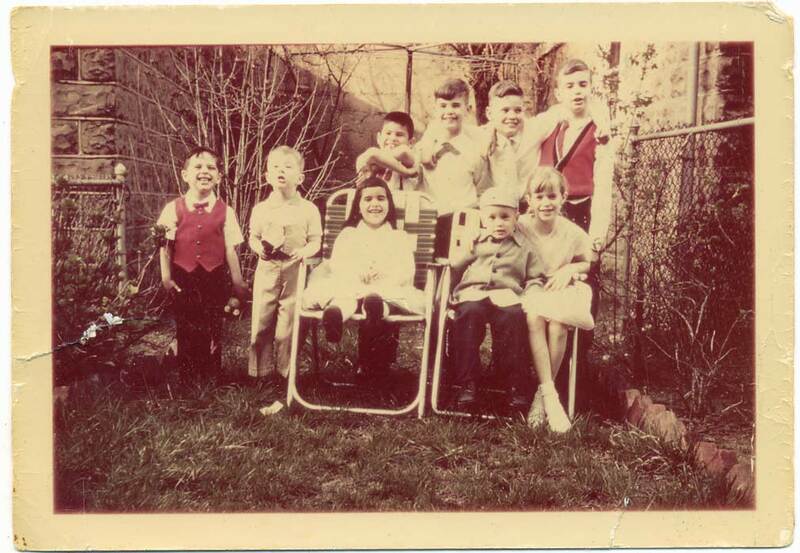 in the 1962 photo, taken in the back yard, your webmaster is second from the left. 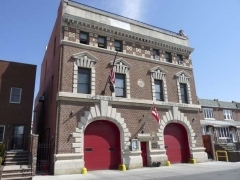 I don’t remember much about these visits, but the Walls had a black cat named Sammy Davis Jr.
FDNY Engine 284 was constructed in 1912 and was likely the first building on 79th Street between 11th and 12th Avenues. The house lost one of its former firefighters, Joseph Graffagnino, on Saturday, August 18, 2007 as he fought a blaze in the condemned Deutsch Bank Building near the World Trade Center site. 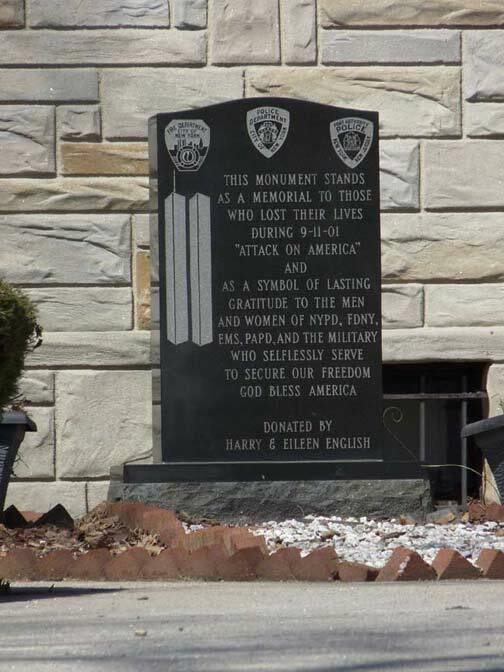 Graffagnino was a part of Engine 284′s deployment to the WTC on 9/11/01. 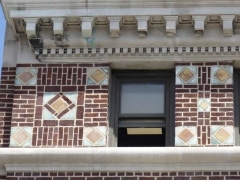 The firehouse features large window lintels and terra cotta designs on the roofline. 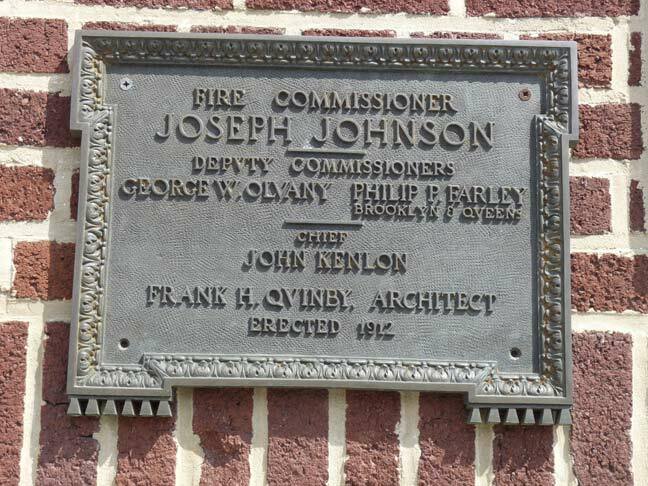 The plaque, with the pompous Latin “u,” names Fire Commissioner Joseph Johnson, who served in the Gaynor and Kline mayoral administrations. At age 102, this is one of NYC’s oldest firehouses. 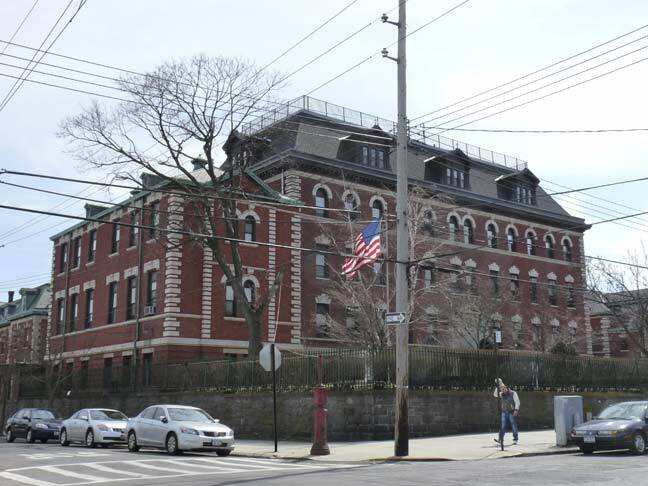 Dyker Heights I.S. 201, an “intermediate” or junior high school at 12th Avenue and 80th Street. Take a look at the school’s antique website, which hasn’t been updated since 2010; even then, it looked straight out of 1995. 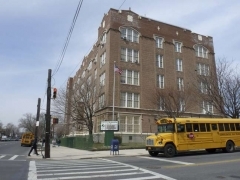 Actually the school hosts a newer site, so it’s a mystery why the older one is still around. 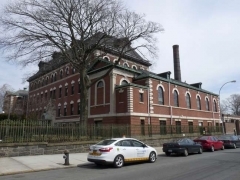 The building appears to be nearly a century old; school websites rarely divulge architectural information. 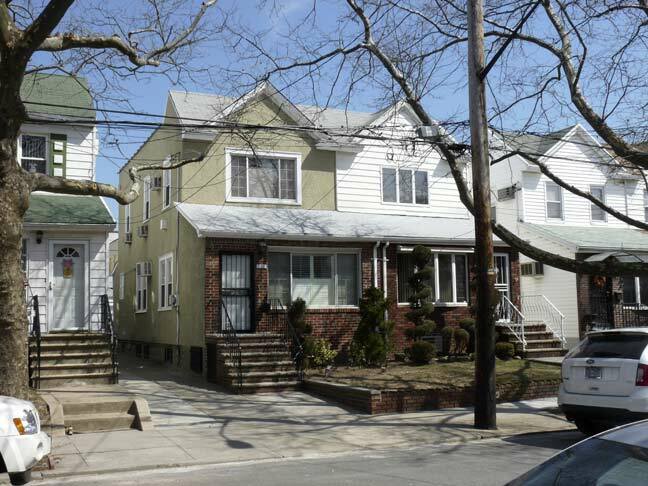 The history of Dyker Heights had been something of a mystery until recently, for me at least, as I couldn’t find much online. However, filmmaker Angelo Bonsignore and Dyker Heights historian Christian Zaino have put together an excellent hour-long video, linked on this page, which explains its history and details some of its fine architecture. 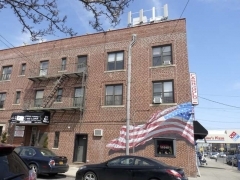 It was at 13th Avenue and 78th Street that the target was finally in sight, across the street with a painted image of a smartly snapping American flag. Like many Blimpies these days, it leases space inside an already existing delicatessen, with the Blimpie assuming the role of the sandwich counter. I ordered my usual, turkey and swiss with white onions, lettuce, sweet peppers, oregano, oil and vinegar. For me, eating at a Blimpie is rife with rite and ritual. The camera bag and cap were carefully removed and set on the table, the newspaper was opened to the article I wished to read, and I settled in for 45 minutes. With me there is no constant checking of mechanical devices. I carry a flip phone that usually acts as a clock. I can call 911 in emergencies, if there are any. I eat slowly and work on the diet coke after the meal is finished, to prevent a too-soon bathroom search. 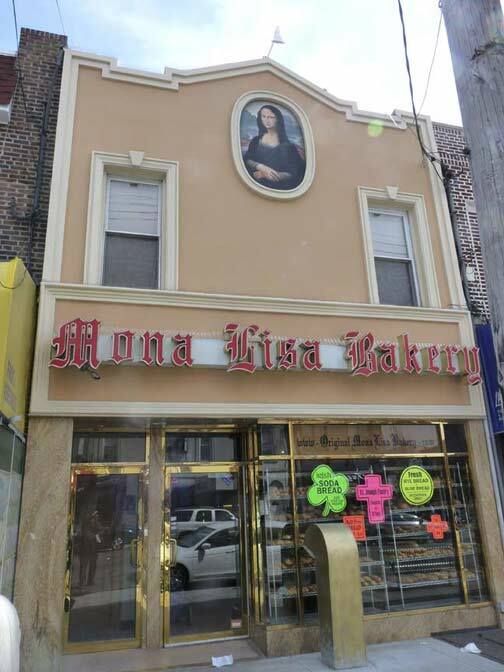 Dyker Heights has retained somewhat more of its pure Italian-American aura, unlike neighboring Bensonhurst, where more mixing has occurred. 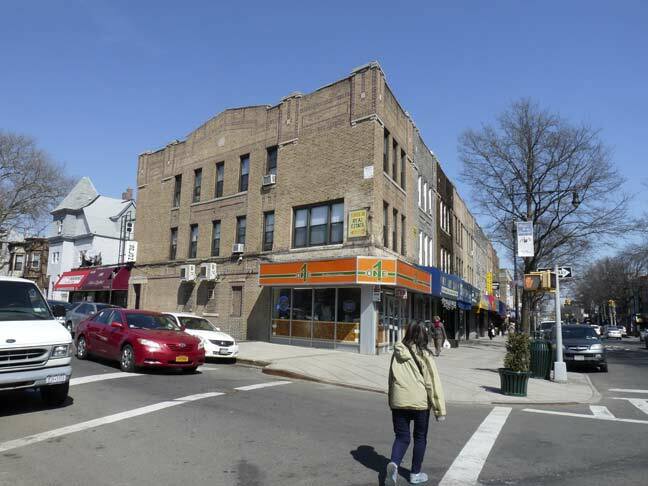 It is common, while walking just a few blocks on 13th Avenue, to see several bakeries and pizzerias. This is a couple doors down from the Blimpie (as is a rival Subway sandwich joint) and Herself can be seen at the roofline. 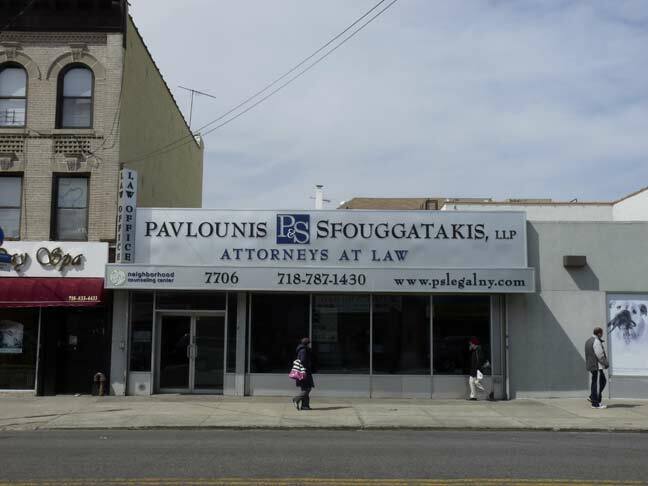 The awning sign on 13th Avenue features the rarely used Bernhard Modern font. Probably its most prominent use was on the front and end titles of CBS’ Twilight Zone from 1959-1964. 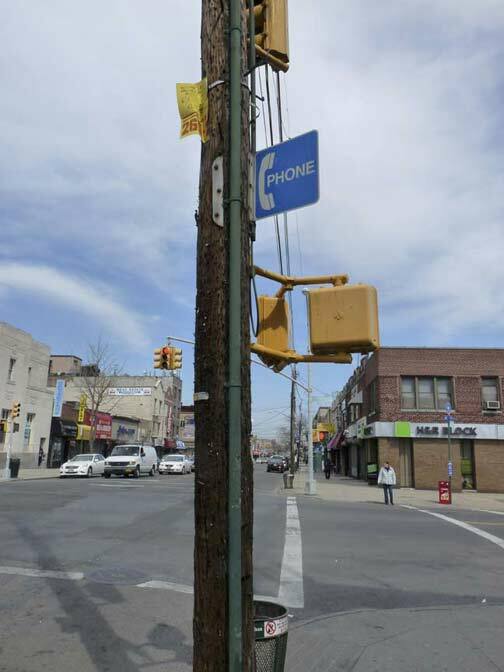 A sign on 13th Avenue and Bay Ridge Parkway for a public telephone that vanished quite a while ago. 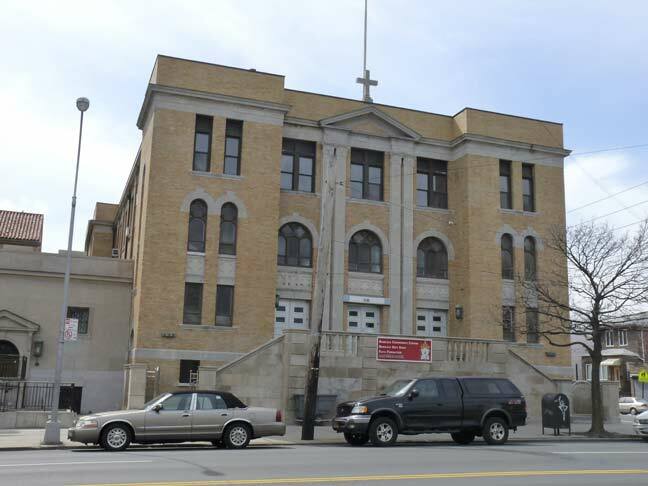 A majestic edifice at 13th Avenue and Bay Ridge Parkway. Now one of the ubiquitous branches of the Hong Kong-Shanghai Bank Corporation, I’d say it was built as a Lincoln Bank building; the bank favored these stolid stone masterpieces. At 7010 we find the former Endicott Theatre. This had to be a theatre at one time; what bank building would include a frieze of pan-pipe and tambourine playing fauns? Situated in the Dyker Heights section of Brooklyn, the theatre was the flagship of the Endicott Circuit, which also had its headquarters in the building. In “the old days”, the circuit was never more than minor-league, running only late-run houses in Brooklyn and Queens/Long Island. 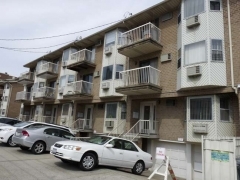 In 1945, besides the Endicott, they included the Avon, Garfield, Hollywood, Metro, 16th Street, and Sun Theatres, all in Brooklyn; the Boardwalk in Arverne, the Edgemere in Edgemere, and the New and Rivoli in Rockaway Beach. 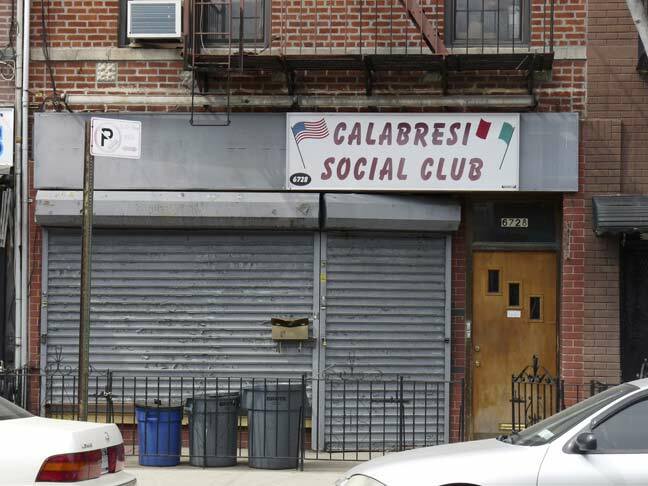 The Calabresi Social Club, a reminder of the old-world Italian immigrant presence, on 13th Avenue between 67th and 68th Streets. 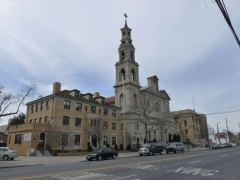 Another such reminder is the palatial Regina Pacis Catholic Church, 65th Street between 12th and 13th Avenues, the tallest building in Dyker Heights. When I had an apartment on 73rd Street and 7th Avenue in Bay Ridge, more than a mile away, I would occasionally ascend to the roof and was able to see the campanile tower (more impressive was my ability to see the downtown Williamsburg Bank Tower from there, which was about 5 miles away). 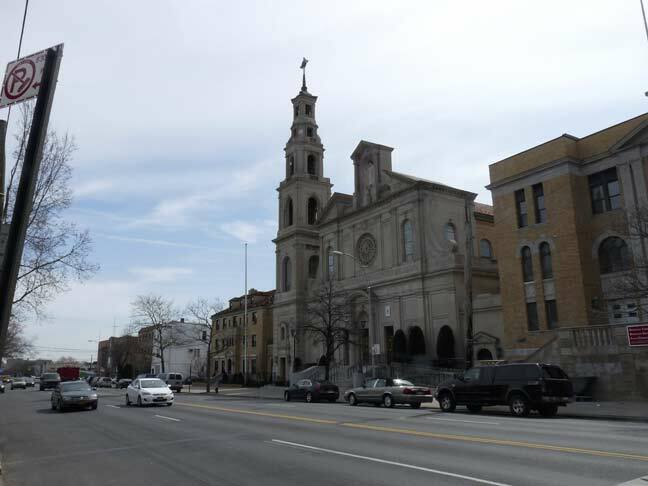 When I was out bicycling, I always knew I was nearing home when the spire of Regina Pacis appeared in the distance if I was coming back via Bensonhurst. 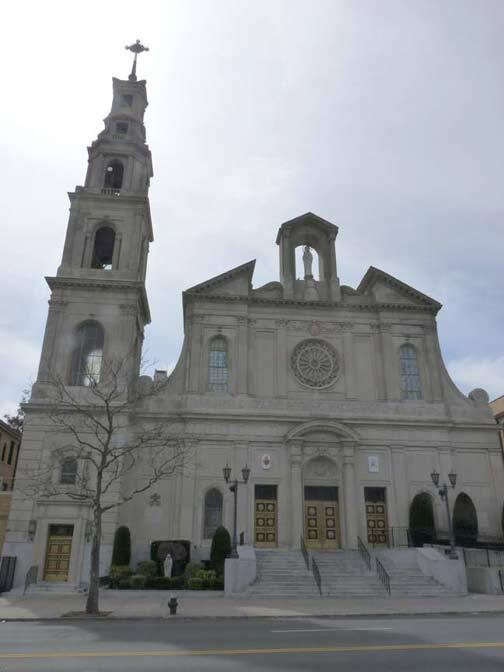 The church, whose campanile is 150 feet high, was consecrated in 1951, but had been preceded by smaller church buildings. 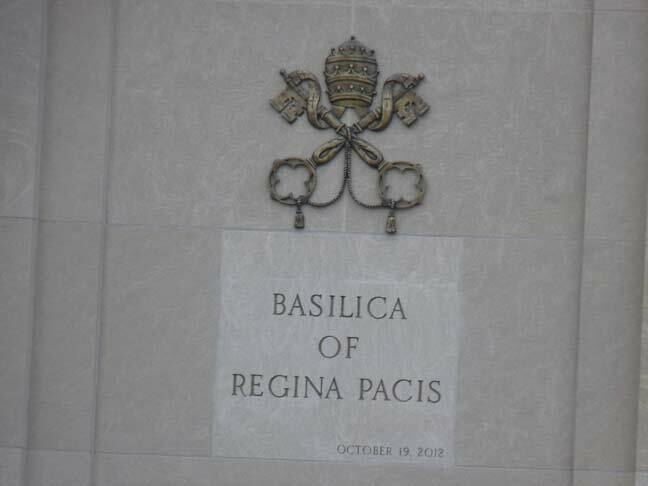 Regina Pacis was designated a minor basilica by Pope Benedict XVI in 2012. Legend has it that when several jeweled crowns at Regina Pacis were discovered missing, mob boss Joseph Profaci, who resided in the area and worshipped at the church, let it be known that the hardware was to be returned and, even though it was, it was a transgression that could not go unpunished and the thief was later strangled. From the link above: Artistic embellishments and treasures abound in the shrine. Above is the 60’ by 27.5’ ornamental ceiling painting of Mary’s Coronation in heaven as the Queen of Peace. The Holy Trinity appears in the clouds surrounded by angels and other heavenly figures. Below, on Earth, is a representation of the shrine, clergy and parishioners gazing upwards. Off to the right, one of the figures is clearly that of Msgr. Cioffi. Joseph P. Leuzzi, an octogenarian and retired attorney now residing in Ramsey, N.J., lived down the block from the shrine and served as an altar boy at St. Rosalia’s and Regina Pacis. The monsignor pointed out one of the altar boys in the painting and told the young boy that it was a painting of him. 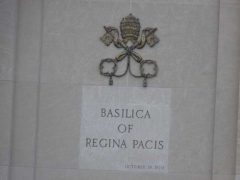 The neighborhood in which Regina Pacis is located has been sometimes associated with organized crime. 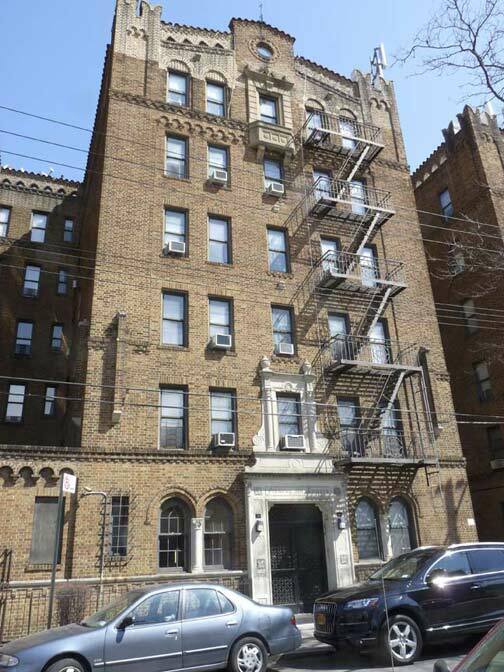 Joseph Columbo, of the crime family bearing his name, lived a short distance away on 84th Street. Prior to it being called the Columbo family it was known as the Profaci family, led by Joseph Profaci. Although he was the head of a criminal enterprise, Profaci was reputedly a very religious man. It is also reputed that his image is likewise represented in the celestial painting adorning the shrine’s ceiling. 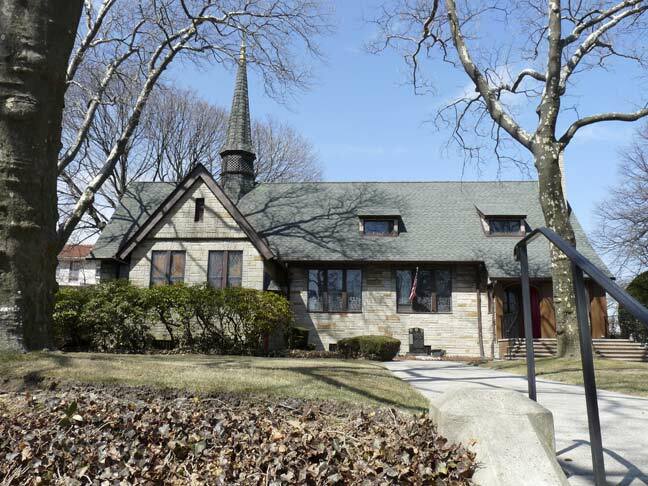 Across 65th Street from Regina Pacis we find a grab bag of architecture, including an ancient-looking porched house that looks like it was last touched up during the Truman Administration. Don’t light a match near that railing. A bit further west are some of the objects passed off as “houses” by latter-day developers. 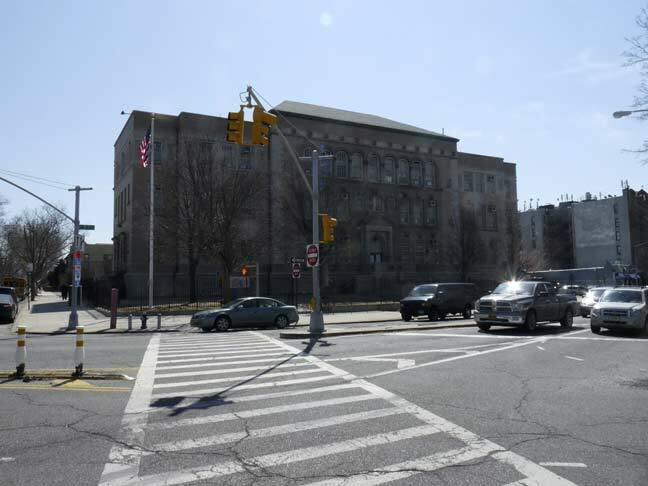 Regina Hall, the parish conference center, and IS 187, the Christa McAuliffe School, face off across the intersection of 65th Street and 12th Avenue. Christa McAuliffe was a civilian mission specialist aboard the Challenger Space Shuttle, and died with the rest of the seven member crew when Challenger exploded 73 seconds after launch on January 28, 1986. Christa McAuliffe graduated from Framington State College, Massachusetts, in 1970 with a degree in history. A dedicated junior high school teacher (she taught history, social studies and civics), Christa McAuliffe was also a volunteer with her church, a Girl Scout Leader and a hospital and YMCA fundraiser. 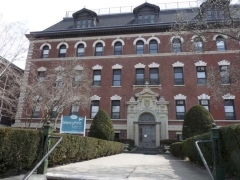 It’s surprising to find a pile of High Victorian like the the Angel Guardian Home (now Mercy First) which has sheltered unwed mothers and their children since 1899. Then, this part of town was far removed from anything else, but there was still a certain pride and dignity placed into the construction of housing for people who, in that era, were mostly shunned by society. Given its location — you expect to find such architecture in a Park Slope or a Bedford-Stuyvesant — I enjoy this building so much that I can’t resist taking multiple photos of it whenever I’m around. The Sisters of Mercy put the building up for sale in late 2017; I hope the building stays intact. Across the street from Angel Guardian is this object, which makes you wonder about the sanity of whoever is running the architectural schools these days. 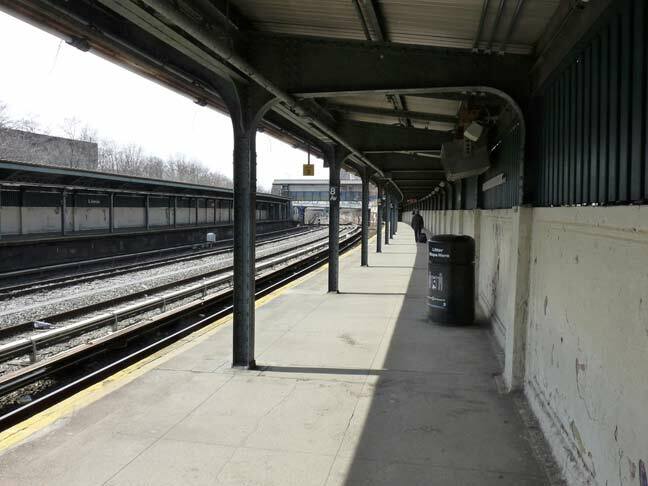 62nd Street, along the BMT N train — Long Island Rail Road open cut, is about as scruffy a stretch as you will find in Dyker Heights and indeed, this is the northernmost street in the neighborhood, as Sunset Park lies across the tracks. 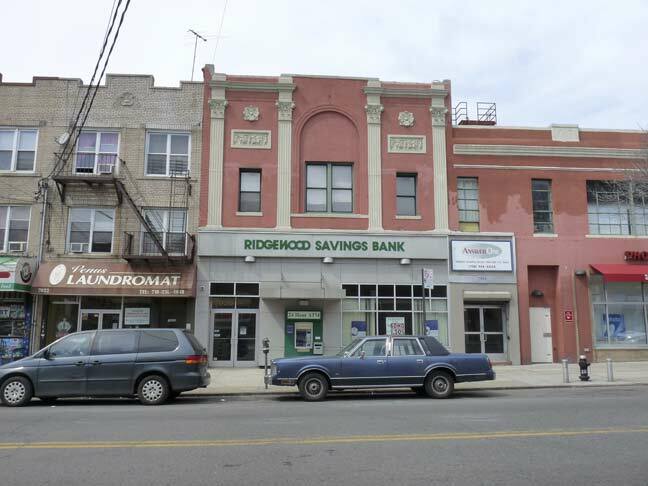 Even so there are architectural gems to be found if you looks, like this group of brick buildings that are found at the SE corner of 62nd Street and 9th Avenue. 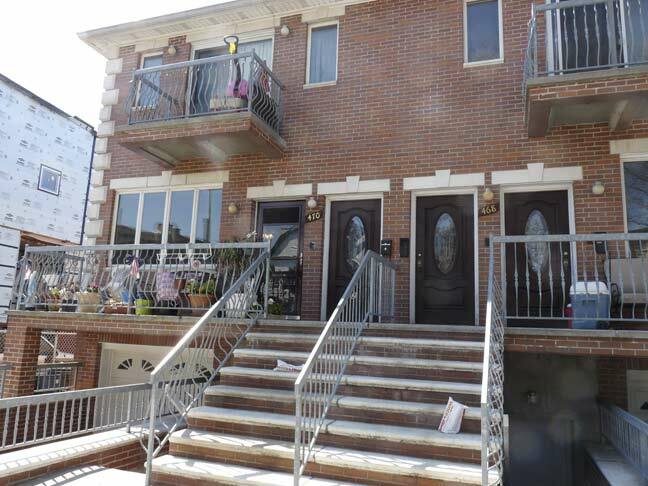 The original wrought iron railings are still in place, like diamond rings in a cracker jack box. 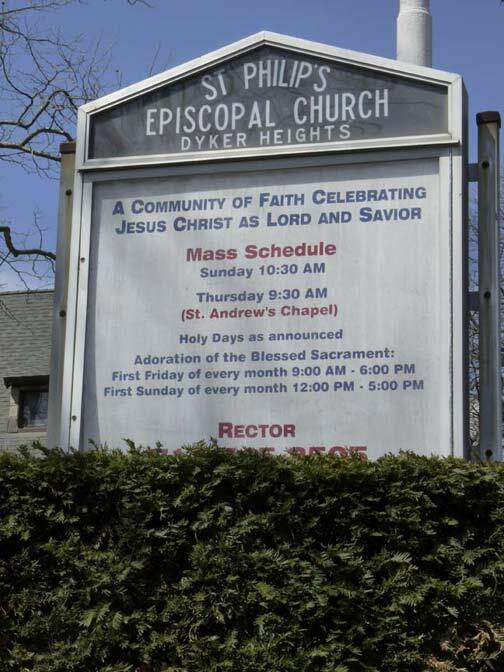 9th Avenue can’t get a word in edgewise in Dyker Heights – it is interrupted by both Lief Ericson Square and sputters a few block before being stopped again by the railroad cut. 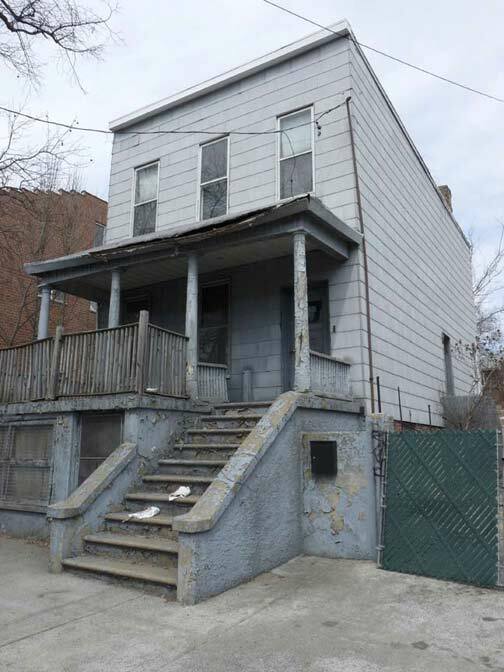 It finds its stride in Sunset Park. Oddly, in Windsor Terrace 9th Avenue is known as Prospect Park West, even between 15th and 20th Streets, where there is no Prospect Park for it to be west of. I found an American flag and a Swedish Norwegian flag flying by a seemingly empty yard on 62nd Street between 8th and 9th Avenue. 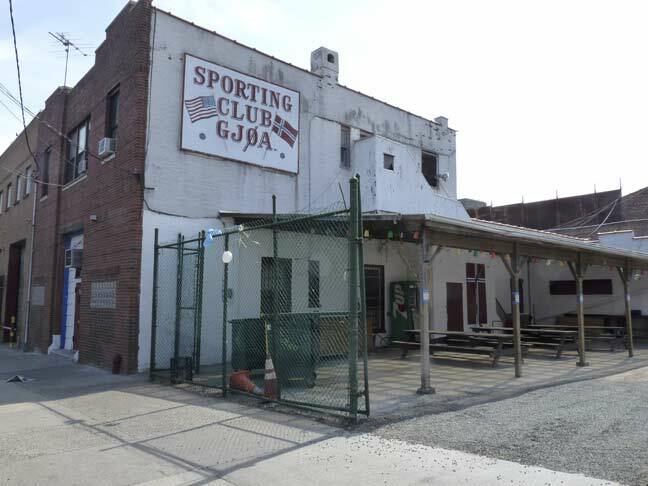 I knew I had come upon one of the last palpable representations of Scandinavian Bay Ridge and Dyker Heights — the Gjøa Sporting [Soccer] Club. …[T]he ship, known as the Gjøa, was commonly regarded as one of Norway’s historic treasures. Built in 1872 in Norway to be strong and reliable, she was named after the owner’s wife, which was a common practice during that time. Capt. Ronald Amundsen bought her in 1901 and fit her with a13 horsepower engine. From 1903 and 1906, Amundsen’s command, the 70-foot craft had gone where no ship had sailed before, and her Norwegian crew achieved success where all others had failed. 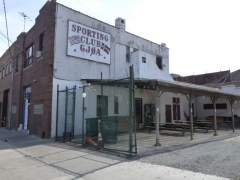 The soccer club is near the old Soccer Tavern on 8th Avenue and 61st Street, and in my youth my father would frequently attend the soccer matches at what is still known as Dust Bowl Park at 8th and 65th, which has since been artificially turfed. 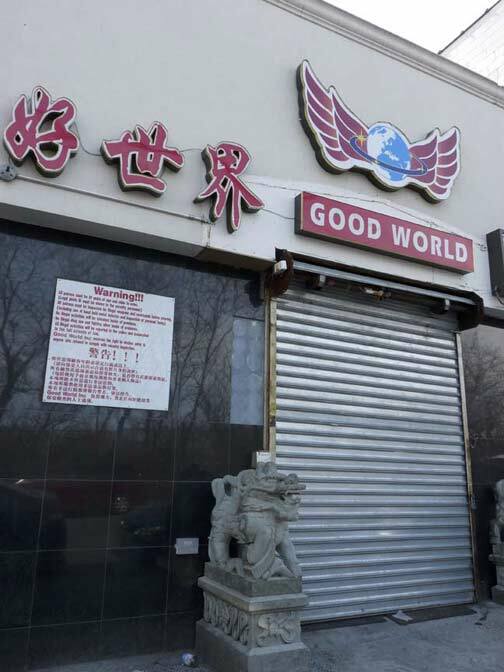 Across from there, a succession of eateries gave way to Zeke’s Roast Beef, which I visited weekly for over a decade until I moved to Flushing. 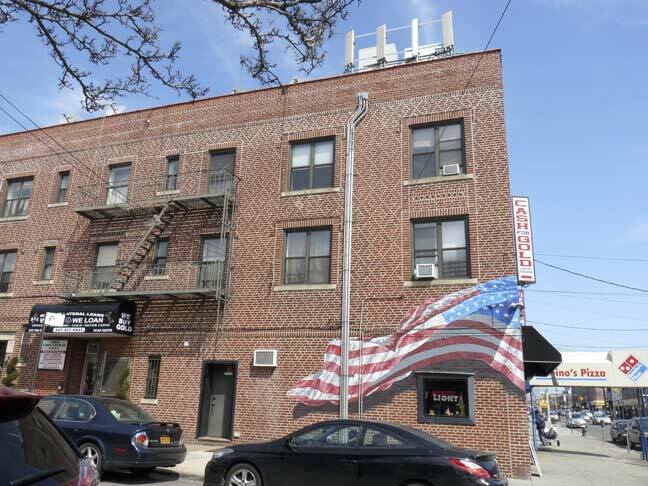 The inexorable demographic shift finally doomed Zeke’s, which became a Chinese eatery, but Zeke’s was later revived in a smaller venue on 3rd Avenue in Bay Ridge. 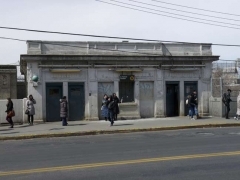 Old Dyker and new are juxtaposed on 62nd Street, as this Chinese nightclub is adjacent to the Sporting Club. Time to kick it in the head for the day. 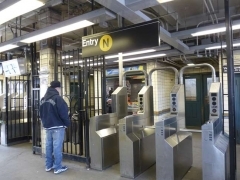 The N train will get me to Queensboro Plaza and a connection with the #7 train, which gets me to the Long Island Rail Road at Woodside. 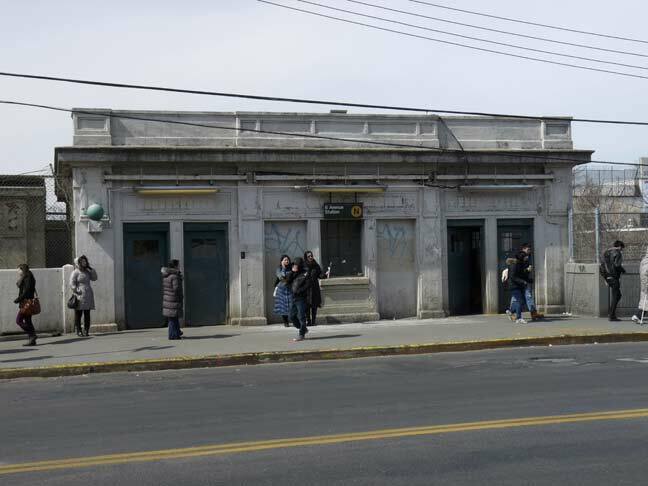 The N train is an outgrowth of the old Sea Beach steam railroad, which originally ended at a seaside hotel by the same name in Coney Island. In 1915 the railroad was modernized with a third rail and placed in an open cut by Brooklyn Rapid Transit, a precursor of Brooklyn-Manhattan Transit, or the BMT. 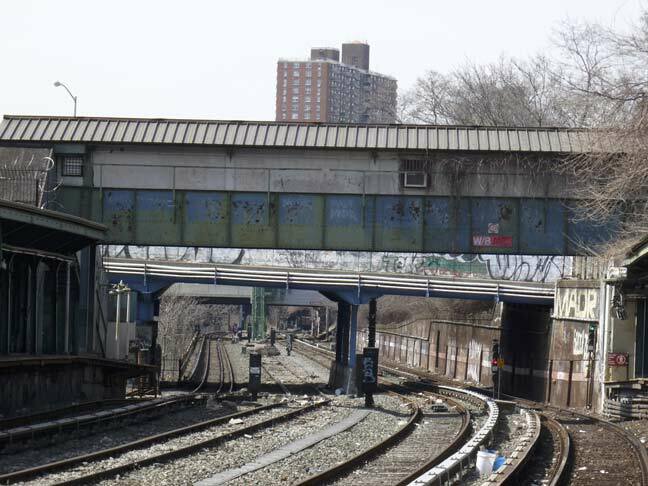 The line, still called the Sea Beach, would soon gain a Manhattan connection via the Manhattan Bridge. The line also gained a series of headhouses like this one at stops along the route. Despite acquiring high gate turnstiles and a large “token booth” the building still has elements of its original BRT construction such as beige “bathroom” tile and terra cotta diamonds on the exterior. 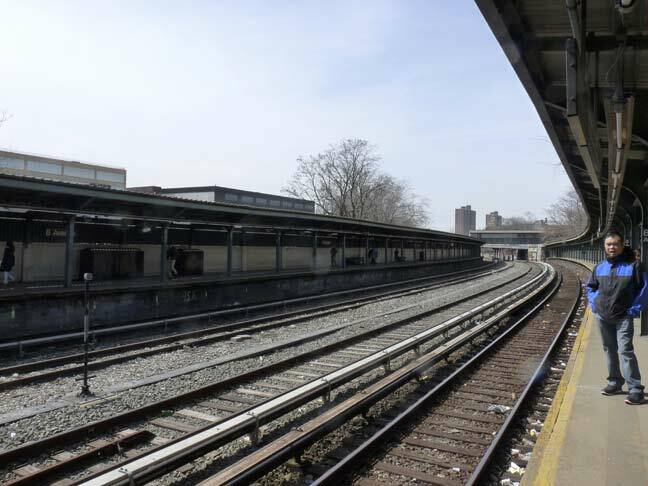 The 8th Avenue station is built on a curve and is the first of the N line’s open cut stations going south. There’s a crossover on its west end that has never been open in my experience. While I lived on 73rd Street and 7th Avenue from 1982-1990 this was my home station, though I could also use the R train at 4th Avenue and 77th. 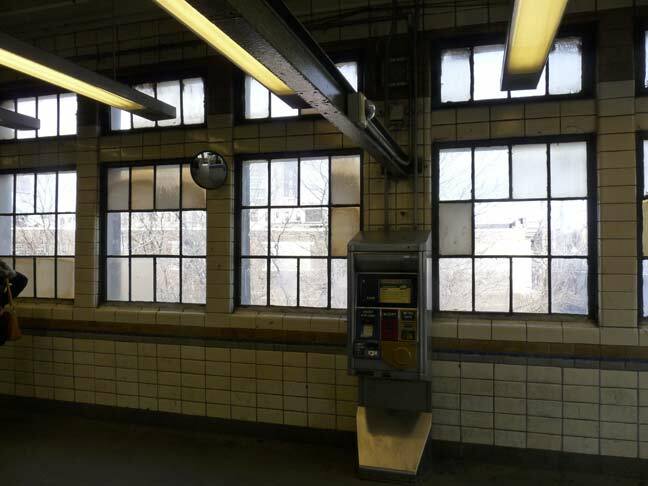 I’d walk to the 8th Avenue station in the brighter and warmer months, since I worked nights and would leave the house around 4 PM, earlier if I was stopping at Zeke’s first. I don’t regret working nights for over 8 years. It was steady work with overtime and medical. 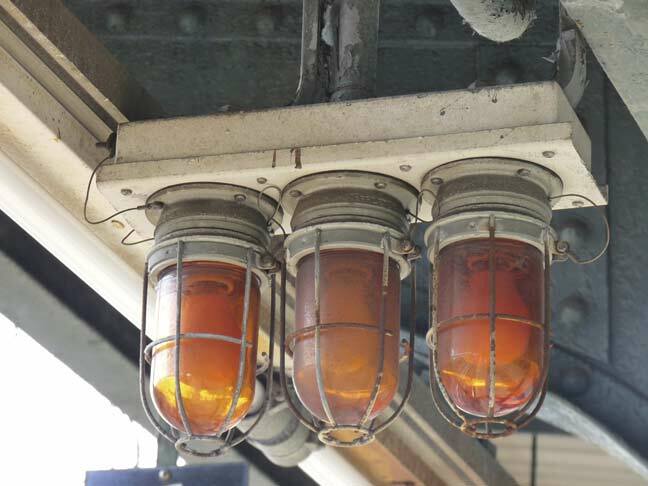 If three lights in an orange casing are lit up, the conductor has to hold the doors open to wait for the express train. I can’t account for their presence here, since there’s no express platform. Would any train professional chime in on what the lights signify here? 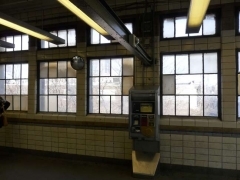 At a terminal station, these lights would then be the “Start” signal, when lit telling the motorman of the train to proceed on its scheduled trip (in other words, opposite of its “Hold” meaning at a thru station). 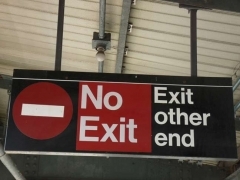 However I cannot explain why it would be at the 8th Ave. station, unless it’s controlled by the station tower at 59 St.& 4th Ave., for when they may be traffic congestion ahead at that station and/or the N train is being directed to merge with R trains onto the local track. I played with the Regina Opera Company at 65th & 12th a few years ago. They’ve since moved to Our Lady of Perpetual Help in Sunset Park, at 59th & 6th. They also updated their website which looked like it had last been designed in 1996. I also prefer Blimpie’s to Subway: BB or tuna, with sweet peppers, onion (either type), tomatoes and oil/vinegar. Kevin: I had to stop reading this page after the first paragraph! I cannot agree with you more about how bad Subway’s sandwiches are! On the rare occasions that I have had no choice but to eat there, I’ve always noticed that as soon as I order a sandwich, the clerk immediately asks me if I want the bread “toasted”. You better say YES; otherwise the un-toasted bread will ALWAYS be stale. Baked fresh, my foot! I will gladly credit you if you specify the paragraph I used. I did link to the entire article just now. I worked at Gertz Plaza in Jamaica from 1985 until my retirement in 2004. There was a Blimpie store in the basement food court. It was always a thriving enterprise with the reputation for the best coffee. Since I relocated out of state in 2005, I have no idea if the place survives, but if you want to make a recon run, & it’s still there, say hello to the owner, Raj, for me. Re: Date when I.S. 201 was built. 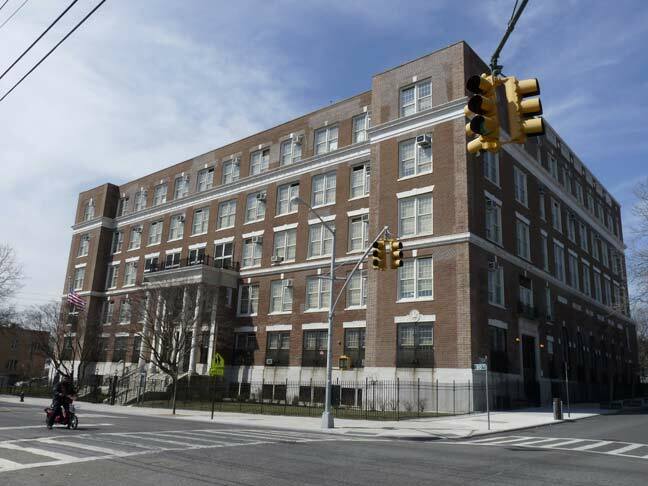 I went to PS 206 (Gravesend Neck Rd and E. 22 St, Brooklyn) which is of the same architectural design as IS 201 and many other schools in the city. P.S. 206 was built in 1922, so I would assume that IS 201 was built close to that time. While your link does go to I.S. 201’s “original” website, which is actually quite charming, there is another link there that takes you to their new and updated (modern?) website…. No wonder Jarret lost all that weight eating at Subway. Kevin, I’m glad that you were able to find a Blimpie. I haven’t a sandwich from them for a while. As a matter of fact, the last time I had from them was probably back when I was at the Metro Games as part of the Special Olympics over at Riverbank State Park in the late 1990’s. Also, they haven’t been advertising for over a decade or at least that’s the case for me when watching TV. I do find Subway to be overrated for the most part not to mention very pricey, but my little brother seems to like it Even Quizno’s had better sandwiches than Subway especially with more meat, but they to are in decline and don’t have a lot of locations these days either. Still, I’m glad you were able to find what you were looking for along with some interesting scenes along the way. Nice to see a pic of Kevin as a yoot. You failed to mention the mass market swill known as beer in your list. Praise the omniscient cloud dwelling being that there are creatures known as craft brewers who have bestowed taste to a long suffering populous. And I loved the note you ended on, mainly the screech of flanged wheel on steel rail. Very cool station. I shall have to search it out. You have good taste in both sandwiches and real estate. 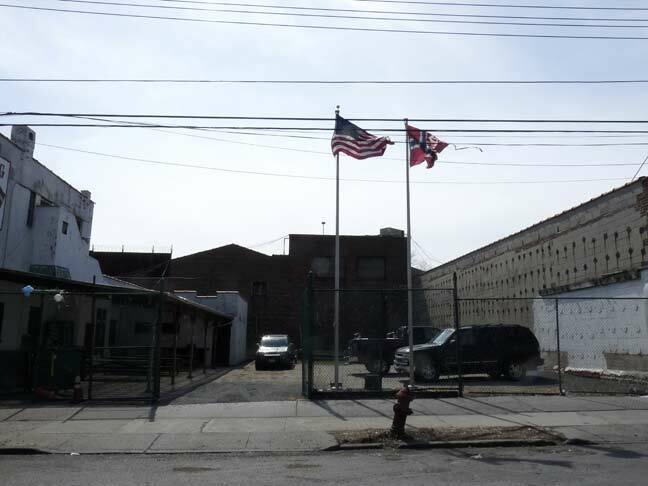 It is a Norwegian flag, not Swedish, flying with the American flag outside Sporting Club Gjoa. Also, Earl Woods, Tiger’s father, was not a pro at Dyker Beach Golf Course. 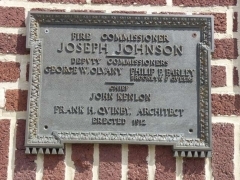 He played there while he was stationed at Fort Hamilton. That is not a Swedish flag. That is a Norwegian flag outside the Gjoa Club. 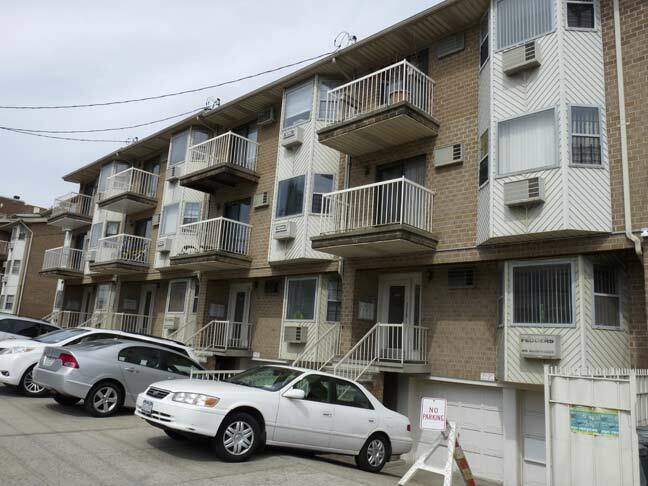 The Parkway Towers is located on 80th Street, not “at #901 7th Avenue”. There had once been a plan, before the area urbanized, to extend Prospect Park to Prospect Avenue. That was why Prospect Avenue was renamed from Middle Street, and may be why Ninth Avenue is called Prospect Park West beyond the park. 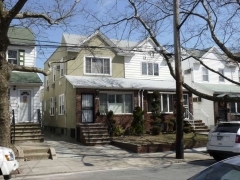 Longtimers (by that I mean several generations) in the area call it Ninth Avenue anyway, as they call PPSW Coney Island Avenue. Blimpies disappeared years ago– along with Nedicks! 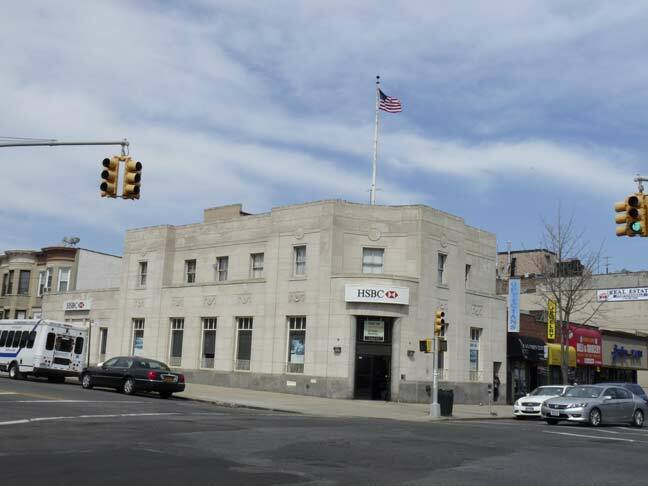 The photo of the HSBC Bank on the corner of 13th Ave & 75th St (Bay Ridge Pkwy) – it was originally Brooklyn Savings Bank (not Lincoln). My parents got their first house mortgage with them. Lincoln Savings Bank was actually on the corner of 5th Ave & 75th St – it still has the penny emblem on front even tho it’s now a Chase Bank! Really enjoy your website. 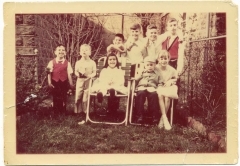 I used to live in Dyker Heights/Bay Ridge for over 25 years and love to see your photos and blogs! You’re in NYC, “Land of the Delicatessen”, and you’re arguing Blimpie’s vs. Subway?!?! Blimpie update…when in lower Manhattan, spotted on google maps, City Hall area, corner of John & Nassau. As of 8/13. Blimpie’s – which premiered the same year as the old “color-coded” vinyl and aluminum street signs, in 1964 – varies in quality from store to store, always has. Even in the days when there was (to paraphrase a Lewis Black routine) a Blimpie across from a Blimpie. I’ve always leaned towards the ham and Swiss cheese combo (on regular white bread) with onions, lettuce, oil and vinegar, and black pepper – and I’ve found from my experiences, amongst the few surviving outlets today, that that sandwich as on the Blimpie’s at East 40th between Park and Lexington Avenues in Manhattan is somewhat better than the one on Pearl and Willoughby Streets in Brooklyn. (Will have to try the one of Broadway and 95th – if it’s still there.) I’ve found comparable (good) experiences with ham and Swiss at a Blimpie’s at Jersey City across from the Journal Square complex, many years ago. Also at Canal Street and West Broadway. As for Subway – didn’t they, at one point, get called on the carpet for using rubber in their bread, the same rubber used for mats and such? (And for which Senator Chuck Schumer ran over an old lady to get to a microphone to wax outrage over same – or so I’m told – about the former part, that is.) Certainly I avoid those places like the plague, like anyone who knows good food from Shinola. P.S. The chemicals that may’ve been responsible for those smells in Subway bread while being baked on premises, were the same as used in the making of shoe rubber and yoga mats, and were taken out of the bread ingredients in February of 2014 after Schumer and others waxed outrage thereabouts. Still a small wonder I avoid Subways.